Brent went to South Africa in February to film interviews for the Lausanne Global Classroom on Creation Care. Lausanne has a global network of people that discuss, write, convene, and promote care of creation as a gospel issue. This means that when Christians take care of creation, it reflects God’s care for us and is a means by which people can come to know God. The basis for this is John 10:10, where Jesus said, “I have come that they may have life, and have it to the full.” How can someone who has no water to drink, lives in filthy surroundings, and cannot grow or eat healthy food live life to the full? When Christians ensure that this happens, especially for the weak and poor, it shows God’s love to the world and people take note. Brent interviewed global Christian leaders who are concerned that this message be sent forth. The interviews took place in the eastern part of South Africa, where it is lush and green. He visited a game preserve and was able to see zebra’s, hippopotamus, rhinos, giraffes, impala, and many other animals. After finishing the interviews, he went to the southwest coast of South Africa and visited Cape Town to check out a training center associated with CIT. Cape Town was in a severe three-year drought and had water rationing in place. It was significant to see how creation and people can be impacted by lack of water after just attending a conference on creation care. He was only there a couple days, so didn’t get much time to look around. But it was enough to get a sense of the climate, needs of the people, and history of the nation. Pray for South Africa, and that the Global Classroom on Creation Care will be produced soon. Another incredible experience was Brent’s trip to Rome, Italy. Again, this trip involved filming interviews for a Lausanne Global Classroom. This time, the theme of the conference was Nominalism. Nominalism is defined as people who identify themselves as Christian, but do not live out their faith. They are Christians in name only. Every form of Christianity, and in fact, every religion has this phenomenon. The focus of the conference was on nominalism in the Evangelical, Catholic, and Orthodox churches. The reason many people become nominal, no matter the brand of Christian faith, is lack of discipleship. Jesus commanded believers in Matthew 28:19-20 to go and make disciples. Sadly, the focus of many Christians is on buildings, worship styles, and money, rather than on strengthening the faith of new believers. Studying about nominalism will encourage better discipleship, build healthy believers, and strengthen the body of Christ. That is why the Global Classroom on Nominalism is important. It will be posted on the Lausanne website free for anyone to access. The hope is that younger leaders, church groups, and training institutions will use the Global Classroom on Nominalism, as well as other topics so that their ministries will be enhanced and made more effective. 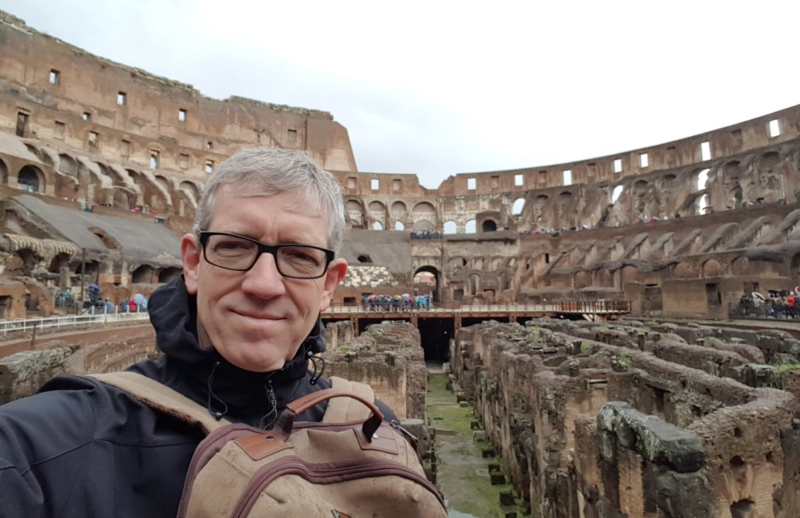 Brent was able to visit several historical spots in Rome, like the Colloseum, above, and the church where the Apostle Paul was buried. It was amazing to walk in a city over two thousand years old, but sad to see many people still in need of the good news of Jesus in a place where there are so many churches. That is truly what nominalism is. Pray for Brent as he leads the Global Classroom team. You have my prayers for the continued working of the Holy Spirit in you and the ministry. May you continue to have strength, wellness and safety in you journey.